World Health Day rolls around on Saturday, April 7 and this year’s theme is “Universal Health Coverage: Everyone, Everywhere.” Universal health coverage, or UHC, isn’t so much about socialized health but about ensuring everyone, regardless of means, can get access to quality health care services when they need them. Around the world, health care is consistently one of the greatest drains on personal resources. In fact, 100 million people are pushed into ‘extreme poverty’ (living on less than $1.90 per day) simply by paying for health care. At least half the world’s population still does not have full coverage of essential health services. The goal of the World Health Organization’s World Health Day, therefore, is not only to increase efforts to create a world in which everyone has access to health care, but also to ensure no one ends up in debt by paying for it. In the developing world, health care and poverty are closely linked. The cost and availability of health care is of course a major issue. More than 800 million people around the world, or almost 12 percent of the global population, spend at least 10 percent of their household budgets on health care. Even in the affluent West, many people struggle to finance their health care needs. Meanwhile poor diet––often a result of poverty––contributes to poor health, and the cost of transportation limits healthcare access to millions. On top of that, individuals forced to care for sick family members may be unable to work, or they may borrow money and find themselves overburdened with debt. Our work at FINCA over the past 30 years has focused on the empowerment of individuals to lift themselves, their families and their communities out of poverty. Underpinning our work is the notion that financial inclusion unlocks greater resilience and opportunity for low-income populations. Access to financial services, for example, enables a micro-entrepreneur to take out a line of credit to jump-start a business. When women are at the helm, this additional income is used to benefit her family, often paying for needed health care expenses. It turns out that not only is there a link between access to finance and access to health care, but also between access to energy and access to health care. Without a reliable energy source, hospitals have inadequate lighting to perform even basic procedures, and are unable to run lifesaving equipment. Similarly, hospitals require a clean water supply to sterilize equipment properly. Without access to energy, this becomes nearly impossible. In such conditions, it becomes difficult to attract talented medical professionals, which in turn reduces the quality of health care. FINCA International has been exploring the relationship between access to finance and access to energy through BrightLife. 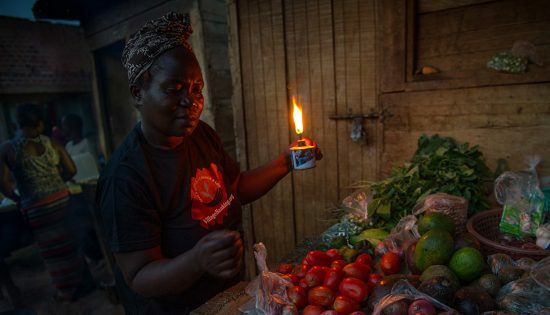 With this program, we are providing off-grid Ugandans with access to solar home systems and improved cookstoves. Nearly nine out of 10 BrightLife customers reported positive health and safety impacts because of these products. We’re also offering water filtration systems to help ensure families are using clean, safe and healthy drinking water. Combined with flexible pay-as-you-go financing, BrightLife products highlight the linkages between access to finance, energy and good health. On World Health Day, the WHO rightly encourages governments, organizations and individuals to do their part in improving the availability and quality of health care around the world. But we should also remember that poverty is a major cause of ill health, and a barrier to accessing health care when needed. Expanding access to financial services and clean, reliable energy has an important role to play in improving health outcomes for those living at the bottom of the economic pyramid.